It is a magnificent feeling to step in cold water (of questionable cleanliness) first thing in the morning. Not fully awake, still in your pajamas and flip-flops. Yep. Awesome. This is the landing of our cellar steps. 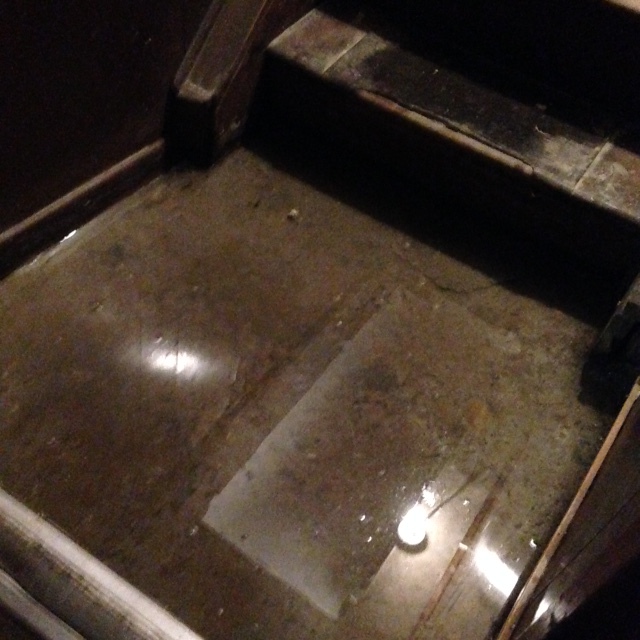 Pictured here is enough water to cover my foot, and is a small sample of what was in our cellar. A neighbor has a ruptured pipe of some sort, which has yet to be properly fixed. This is the third time this has happened since the holidays, but this time they went for extra credit, sending a whole lot of water our way. One of the things that people don’t tell you about townhouse living is that even though you’re separated from your neighbors by stone, bricks and mortar, what happens on one side of the wall frequently has consequences on the other side. The water pictured here, originated 18 feet away at the other side of the cellar, yet it made its way across the wall in the photo, to say hello to our other neighbor. By the time it got there, it had lost some of the oomph and was more or less just a damp spot. The first Christmas we were in our home I bought my husband big rubber boots and he was like “thanks” but he has used them many times! I am assuming your neighbors insurance is going to pay for damage–my question is do you (or him) have to pay the usual $2500 deductible? Our neighbors are flippers without permits. At this point, I’d be happy if they just fixed the problem and stopped flooding our basement. NextI totally have a plan and I’m going to – LOOK! SHINY THINGS!